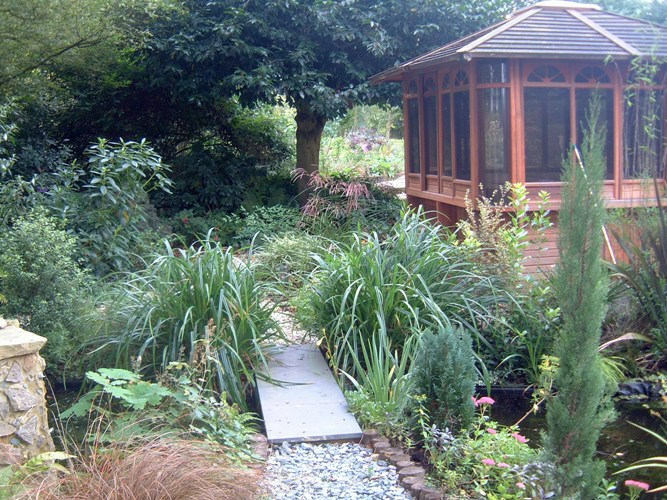 Steyning – creating beauty and enhancing utility in a woodland setting. 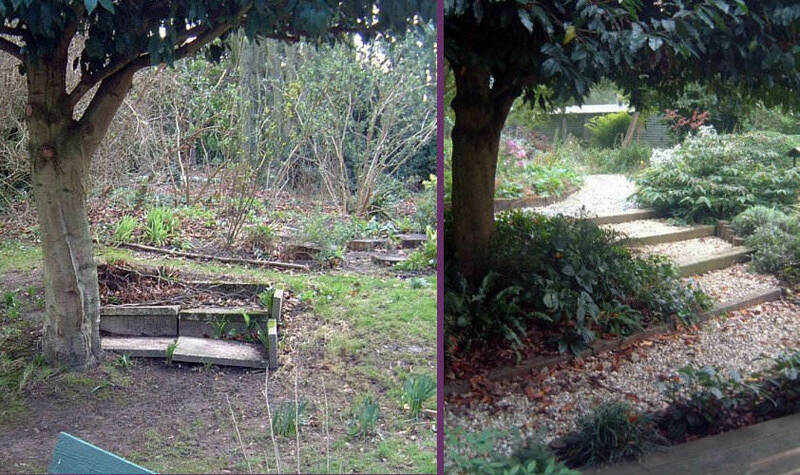 Lovely, Lovely, Lovely was invited to improve a mature, large woodland garden behind a beautiful, flint cottage in traditional Sussex style. An existing decked terrace wasn’t well integrated into the garden and the hot tub on it did not sit comfortably. There was no particular route around the garden. The beds were old, and the plants failed to provide year-round interest. Although the house is set back from the road, traffic noise tended to mar the experience of being in the garden. The main view from the sitting room, over a scrubbed out lawn, was of mature beech trees trunks and, behind, the fence to the road. 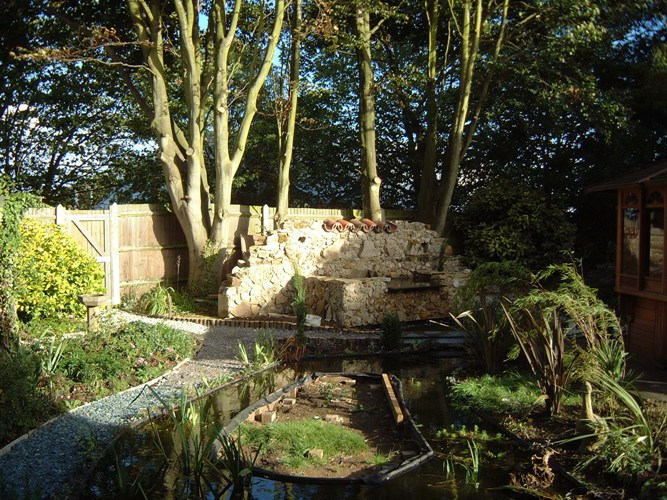 The client’s earlier attempts to beautify this important vista with plants beneath the trees had been thwarted when the beeches prevented the plants from thriving. 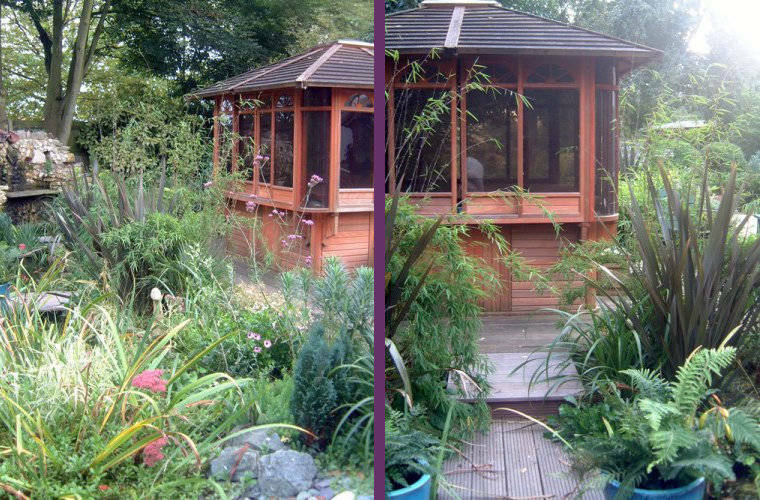 Progressively over several years, we worked with our client to transform the garden. It now has a charming, rustic feel. Defined walkways and low bridges afford visitors easy passage around the newly-created naturalistic pond to the decked area, now a green and luxurious oasis. The pond transformed the former bald lawn into a verdant and lush habitat, abundant with wildlife, greenery and flowers. We later sited a raised pond towards the fence. 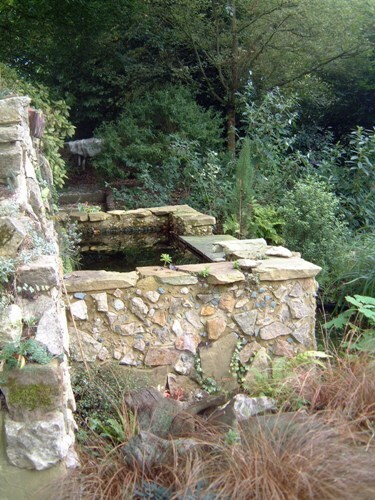 Designed to emulate a ruined, antique mill pond, it was built from slate and stone salvaged from the garden. We designed this so that the plashing of the water masks the traffic noise, whilst the pond creates a beautiful and enticing focal point, which also screens the beech trunks and the fence. 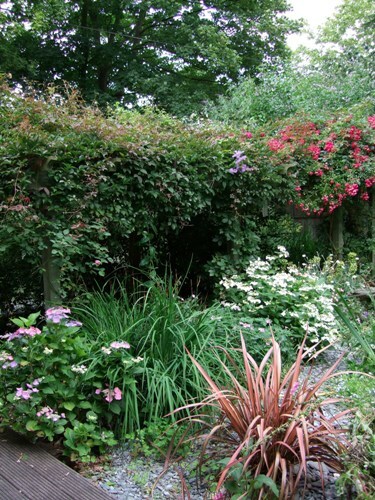 Trickling water at the rear face nurtures tiny plants, chosen to suit the damp and shady situation. 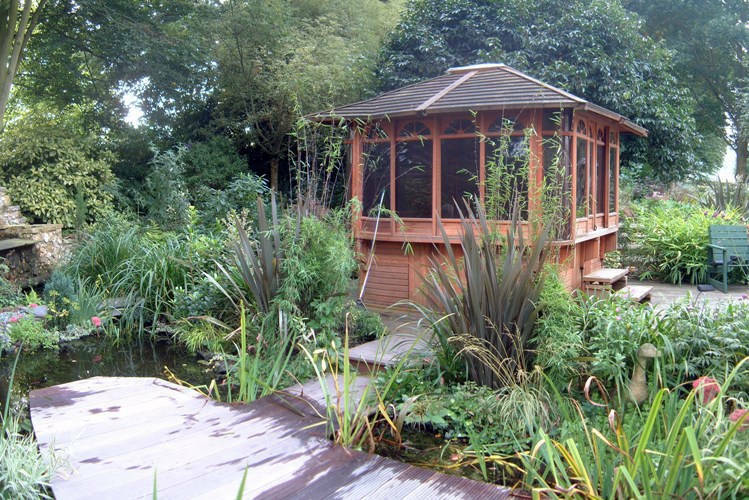 At the front, water plunges pleasingly over a slate slab into a larger pond with an island deck. Like many clients, this one enjoyed our light touch over an extended period in the creation of a delightful garden that is truly the client’s own. From initial consultations that established the overall requirements, the main layout was quickly developed, and then a series of smaller sections of work followed. 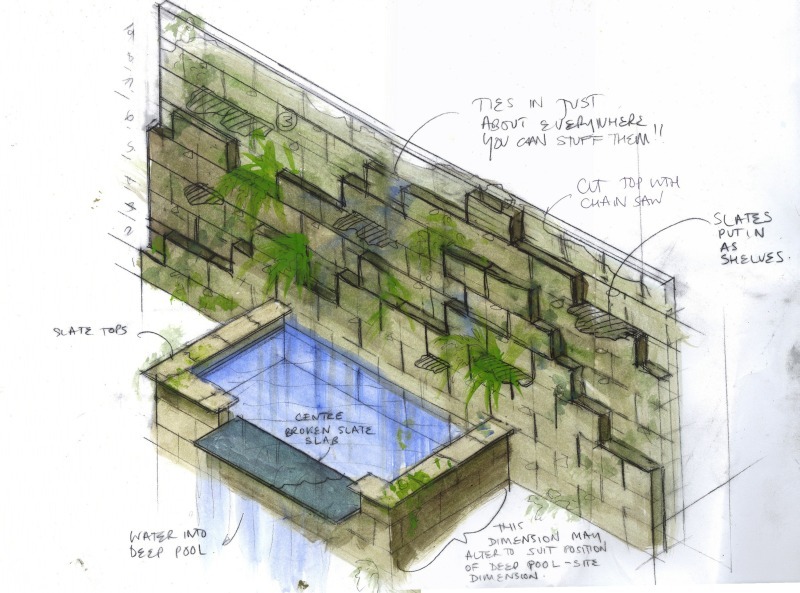 We provided detail drawings of the pond, which was realised by the client’s husband, who conveniently happened to be a builder! 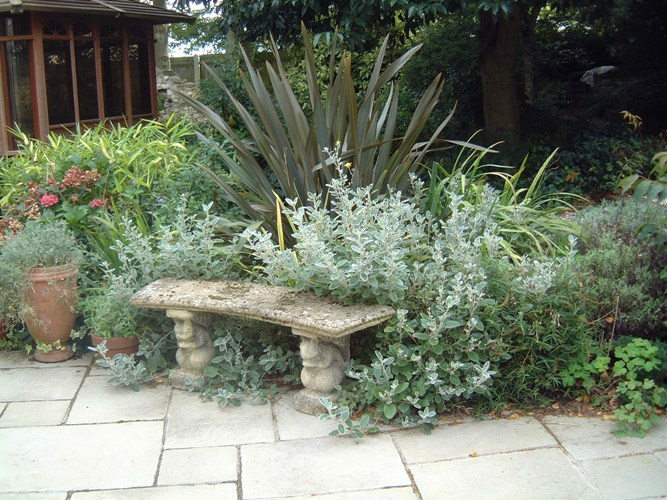 We always works actively to minimise costs to the client, whether by imaginative re-use of materials found already in the garden, by propagating new plants from cuttings from elsewhere in the garden, by collaborating efficiently with the client’s other contractors, or just by “mucking in” deftly. The historic mill pond is six months old! 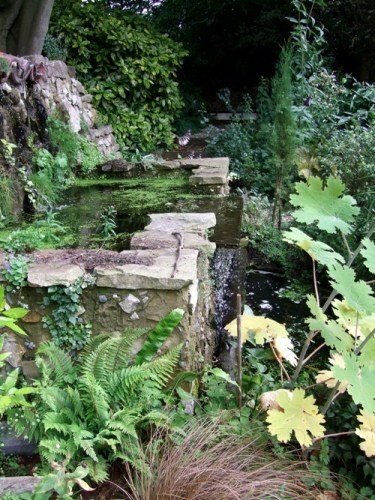 Looking like a wonderful antique “find”, the mossy and cooling raised pond was built with standard concrete building blocks, then rendered with stone and pebbles found in the garden. To help the natural flora to establish itself, we sprayed it with natural yoghurt, before dressing it with tiny mosses, plants and ferns. Our eye for detail was critical in ensuring the look was right. 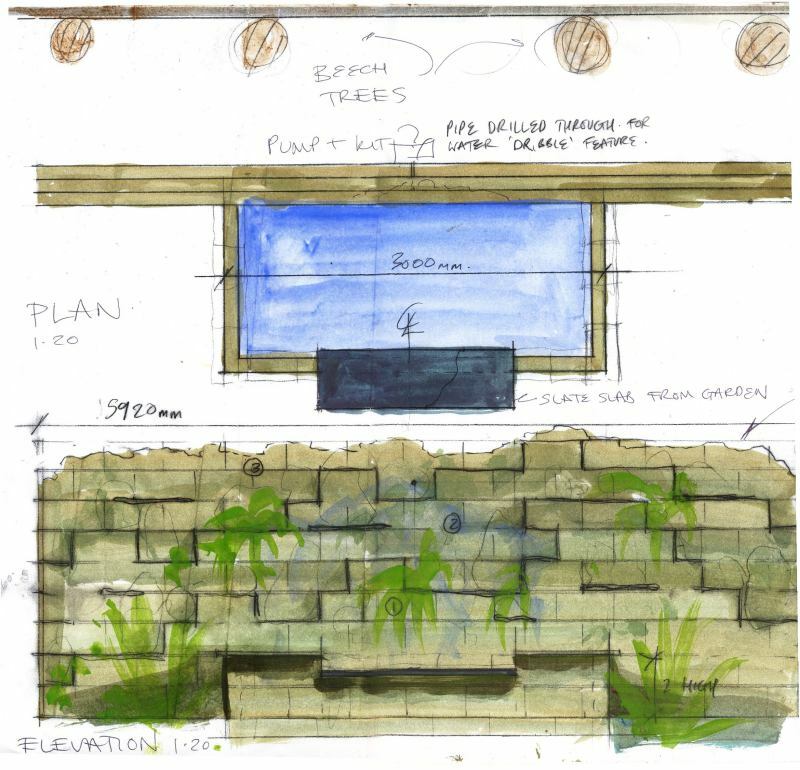 Design sketch for the mill pond. This photograph taken immediately after construction shows the stones set into the render and the pockets for the little plants. Even the most naturalistic garden can benefit from an attractive and ornamental feature like this, even if it is man-made. Of course, sympathetic treatment is essential to maintain balance in such a green, woodland environment. Before: the view from the sitting room. And uninspiring it is! The old beech trees are impossible to plant underneath, so the fence remains undisguised. The beeches become the unintended focal point. And as necessary as the hot tub is to modern living, its appearance is starkly out of keeping with the lovely, flint house. Here you can see how we used a hose-pipe laid out on the lawn to simulate alternative shapes for the new pond. Just built: the view from the sitting room is improving. The new pond, the island, the paths and the antique ‘ruin’ are constructed and ready for dressing. We did the marking out on the ground for the landscapers to create the ponds, and we advised on finishes and construction. We are happy to work with our clients’ existing or preferred contractors. 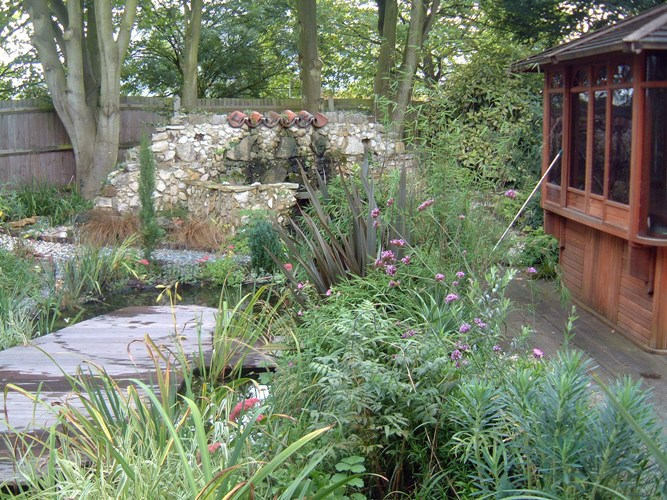 Here, the client had a well-established team of builders and gardeners, to which we added our skills and experience. The fence starts to disappear, the view is softer. As the plants spread, the outlines of the features begin to blur and take on a more established and satisfying look. The island has been decked and the architectural planting is taking shape, drawing the eye away from the hot tub. The ‘ruin’ is rapidly taking on a suitably aged patina. To help our client smooth her cash-flow, we made a point of planting the less costly items first, with the more expensive items going later, as the budget allowed. Lush planting: picturesque and inviting. We created a series of lovely places around the garden and then added pathways that conduct the visitor naturally around them. The waterfall splashing in the pond is delightful to the ear and the dragonflies that soon found the pool are an unexpected and jewel-like bonus. Beautiful plants dress the terrace. The soft evergreen Senecio tumbles onto the terrace edge. The garden feels larger and more sumptuous than before. Room with a (better) view. We think that this shows that pleasing pictures emerge from a good design. We retained and incorporated features, such as the decking and the laurel, which serve to tie the garden together. We designed a central deck section that, although it sits securely on dry land, appears to be floating on the water. This, with the lush planting, gives the hot tub area an exotic feeling. Our client tells us that her only vice now is taking her morning coffee sitting on a chair on the deck in the middle of the pond with the dragonflies flitting all around her! Beautiful! Before, the old laurel stood in scrubby lawn, which was difficult to mow. The path and steps were dangerous in the wet. We needed this pathway as part of the new circulatory route around the garden, so we constructed new timber-edged steps and planted hardy evergreens underneath the laurel, interspersed with little bulbs. This made the area ornamental, practical and beautiful throughout the year. Judicious new planting, together with careful pruning of the existing plants has created a rich pretty, picture that flowers all year round. Visually, the hard edges of the new paths soon softened and vanished. The pergola is now covered in colour, and the path though it takes the visitor directly to the ruined water mill.